“I want to change and better my community, and I am proud to say we have begun to see a difference because of our work. Now, girls and boys in my community – starting from their homes – are treated equally. 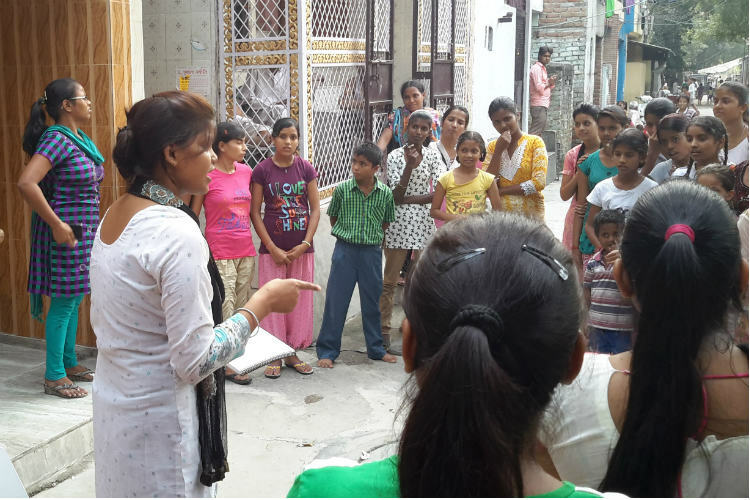 What better way to ensure inclusive development than to equip both girls and boys with the skills to change the world?” says Meera, who’s a 17-year-old member of a Safer Cities girls’ club in Delhi. Meera, who is the youngest in a family of eight and is currently pursuing a Bachelor’s Degree in Commerce from Delhi University, has taken significant decisive steps to make her community safer for girls along with her father. Though she had to face constant eve-teasing while going to school and went out only when accompanied by a family member, Meera was initially very hesitant to join the club. However, all that changed when Meera attended a meeting organised by Plan India on gender equality and women-friendly public spaces. She was so awestruck by the possibilities that lay ahead that she took no time in becoming a member of the Pahal girls’ club. Soon, Meera became the leader of the group and was leading the community activities and safety assessments. Not just that, she also convinced the adult stakeholders and government officials to address the issues that girls in her community faced on a daily basis. She also roped in the local leaders in the initiative. Thanks to Meera, now her locality has street lights and CCTV cameras. They now even have security guards positioned outside local schools to curb eve-teasing. Now, isn’t that just fabulous? But what added to Meera’s success is the encouragement that came from her father, who is an electric rickshaw driver and is also associated with the initiative. Meera convinced him to participate in a sensitisation workshop for the informal transport staff and this workshop marked a significant change in her father’s attitude towards girls. Now, he is not just an active promoter of girls’ rights but also counsels other drivers to ensure the safety of their female passengers. In fact, his rickshaw was one of the first to be selected as a “safe space” for women in Delhi as a part of the campaign which aims to create safe spaces for women in places like public transports and make the homes of supporters available for girls and women across the city in case they want to seek shelter in the times of distress. Even Meera’s mother is also part of the campaign. She is involved with the community’s child protection committee. She works with her daughter upon gender equality and parents’ responsibilities regarding child rights. If Meera’s story is not inspiring in itself, it’s amazing to see how this teenager, who is a powerful symbol of change, involved her entire family and community in taking significant steps towards building a safer city for girls.